Breakfast in Italy is usually a sparse affair. A cup of milk and coffee with a few cookies. 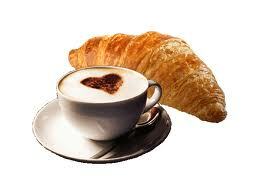 A cup of cappuccino and a pastry. For children, milk and cookies or pastry. Instead of the cookies or pastry, maybe a slice of bread with marmalade. But Easter breakfast, the first meal after the forty-day austerity of Lent, is a grand occasion. With much to-ing and fro-ing, people gather in the ingredients for the feast in the days beforehand. Eggs, not a traditional breakfast food in Italy, top everybody's list. As a symbol of rebirth, hard-boiled eggs are a part of the Easter feast. In the meantime, the parish priest visits during Lent to bless the house. It’s quite a regimented operation in my neighborhood. The building doorkeeper canvases the residents to learn who wants their apartments blessed and reports to the church. Then a date is announced, and someone is expected to be home to receive the priest. If he comes during the week before Easter, the family will have boiled eggs—one for each family member—available for blessing. The priest came to my building a couple of weeks ago, so the faithful will carry a basket of hard-boiled eggs to church a day or two before to be blessed for the Easter breakfast. On a television show recently, I saw a chef talking about Easter breakfast. 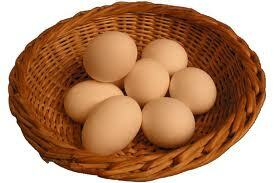 His basket held some eggs marked with a black cross while others were plain. He explained that cross identified the blessed eggs so that if people wanted more than one egg, they could make sure to reserve a blessed one for each family member. Traditionally, children color eggs on the Saturday before Easter, but not, I think, the blessed ones. 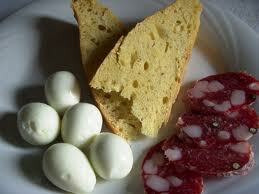 A second requirement for Easter breakfast is salami, specifically one called corallina from Umbria. This sausage is made with ground pork shoulder and ham and studded with cubes of pork fat. It flavored with salt, pepper, and garlic steeped in wine. Stuffed into natural casings, the corallina is smoked with juniper berries and then aged for three to five months. The corallina is accompanied by pizza della Pasqua (Easter pizza) which is a yeast bread made with cheese—usually goat cheese—and eggs. 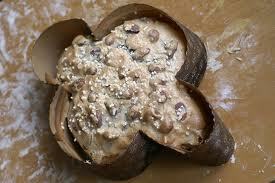 The dough is sprinkled with grindings of black pepper. I especially love pizza della Pasqua and always look forward to finding it in shops before Easter. Though not an Italian tradition, it's wonderful toasted and slathered with butter; I may be the only person in Italy who eats it that way. Depending on the number of people, there may be other cold cuts and cheese. There can also be fritatta, and even a lamb dish cooked with artichokes, but some people think that’s too heavy for the morning, especially since lamb will probably be on the lunch menu. Easter breakfast is often accompanied by red wine. Next comes the Colomba, a sweet bread baked in the shape of a dove, the symbol of peace. The dough for this bread often incorporates candied fruits, especially orange and lemon peel. It’s covered with a crunchy, sugary topping studded with whole almonds. Some people may also serve fresh ricotta—especially made with goat’s milk—with honey. When everybody is sated, cups of espresso are poured and the big chocolate egg comes out. After it’s been smashed and the surprise discovered (see my post from last year), adults and children alike nibble on the chocolate. And perhaps Mamma melts some of the chocolate egg with boiling water to make a beverage for the kiddies. Buona Pasqua a tutti! Happy Easter everyone! Fascinating. Thanks for sharing, Patricia. The goat cheese bread sounds wonderful. Have a slice for me, will you? Shall I slather it in butter? Or eat it with the salami?